I couldn't stop at just one file folder card. I thought a wedding card in this style would be interesting. I made my folder longer (I started with 7-1/4x7-1/4) and I kept the tabs the same as Beate's original style. The folder is made with kraft paper, I covered it with some Rebecca DP (from the 06-07 catalog). I like the stitched look, but didn't feel like dealing with All in a Row, so I used some technique tuesday stitches that I bought a few years ago. The insert has a slit punched into it to make room to hold a gift card, a cheque, or even cash. I included the insert here, it looks a little cheesy, because I wanted to showcase where the slit was, but you get the idea. I was experimenting with mixed medias this morning. Asela had given me a few tips regarding markers and pencil crayons. For this image I coloured first with markers, just colouring the image in. Next, I went back in, with the markers, and added 2 layers of shadows where I thought there ought to be shadow. Next, I added some more highlights and texture with pencil crayons. The bits of lighter colour on the cat is actually some texture for fur. My favorite part of the whole image is how the face turned out. I love the eyes. If you have this stamp, you'll know it doesn't come with eyes like that. I coloured a bit of green around the pupil, then outlined it with black, then added that glimmer with white gel pen. For this card, I wanted something simple, but elegant. I started by scoring each side about 1/4" away from the edge. 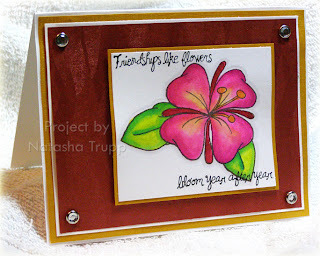 Next I stamped the botanical definition on white, then stamped small floral images overtop is rust. I carefully coloured them in with twinkling h2os. Then punched them out with circle punches. Here's another birthday card. This one was inspired by Debbie's. I didn't have any fancy patterned paper, so I made mine the messy way- Polished Stone . I used Pumpkin Pie and Close to Cocoa reinkers, as well as some gold reinker. Before sealing it, I stamped various leaves from Autumn Leaf Prints in Cocoa, then again in Chocolate. The greeting was done with some nestabilities. I punched the horizontal slot on either side of the tag, overlapping it a bit to make room for the 5/8" ribbon. I layered some May Arts ribbon over the cappuccino grosgrain to add a bit more interest. I thought about adding more to the card, but it's intended for a male cousin, so I figure less seems to be more with guy recipients. I said I couldn't wait to make a sparkly star ornament, so here it is. I cut out one star from chipboard. Then I placed the smallest star on it and cut again to get the window effect. I loaded it up with mod podge and gold glitter. I did that a few times. I had punched out a hole before adding the glitter, which I just needed to poke through with a piercer. I tied some gold cord around, and look at that, an ornament. I'm actually more impressed with how I managed to get a decent photo of it. I hung a cord over my monitor, under my natural light, and then over my white backdrop. I was playing around with my new markers last night and I made a fun discovery. Stamp your image with Stazon onto vellum. Flip the image, then colour it in on with your alcohol-based markers. The slippery surface of the vellum provides easy blendability (the ink takes a tad longer to dry and is reactivated by the other markers if it does happen to dry). The flipped surface means no reactivating the Stazon! Once the image is dry, you can use either side- the stamped side for a more muted look, or the coloured side for a more vibrant look. I just thought I'd throw that out there for those that may be having difficulty blending with alcohol based markers. 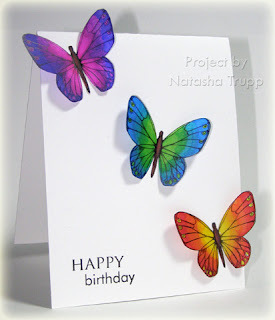 To finish the card, I cut out the butterflies- yes I chopped off the antennae, I just didn't want to deal with them... Once they were cut out, I scored along either side of the body and folded the wings upwards. I put a tiny strip of Ultra Sticky Tape behind the bodies and arranged them on the card. So, at approximately 2PM I received my nestabilities dies. They are fantastic. I got the whole set of ovals and the whole set of circles. Plus, Ellen, being the sweetheart that she is, included a set of star nestabilities as a gift! 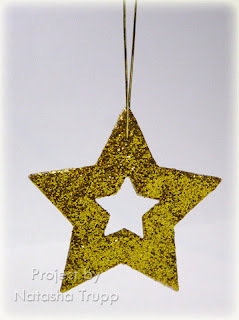 I SO can't wait to make some glittery star ornaments with those! I also got the tan polymer mats that help to make the embossable function of these dies compatible with the cuttlebug. 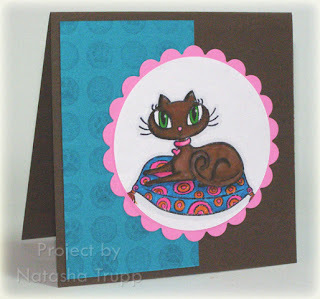 On this card, I did the embossing on the vanilla oval. 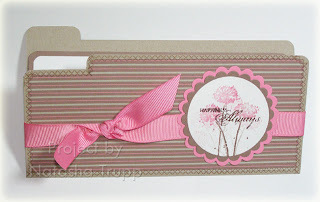 I also used the polymer mats to texture my background with a Fiskars texture plate. I love the effect! I also had to use some more of my new 5/8" ribbon. This one uses the vanilla. I haven't heard back yet from DWB about the ETA of the other 2 colours. At first glance at today's colour challenge, I had no intention of doing it, but then I decided, why not. I use mustard and olive all the time, why not bring bashful blue into the mix. It also gave me a reason to use some of the new luscious ribbon. I used my Old Olive stand-in (willow) on here. The card is pretty self-explanatory. I stamped the flowers, cut them out, and popped them up on a stem. The slider is a die-cut, which the 1" circle punch fits nicely onto. So, all the copic rage has started to get to me, but I refuse to give in 100%. I saw these "Professional Graphic Artist" markers at Michaels for a fraction of the price of copics and prismacolors. I decided, with coupon in hand, why not give them a whirl. They are not bad! I could blend pretty good with them. I don't have an actual blender pen yet, but on this sample, I squiggled some green ink onto a piece of acrylic and while it was still wet, I dipped the yellow marker in it. You can see that on the turtle's body (by Pink Cat Studio, by the way). These markers aren't completely streak free, but they are good for the price. For now, you don't get to see the completed card, because it's not done. In the middle of it, the ribbon arrived! Well, most of the ribbon. Two of the colours are a little behind (grey and celery). So I've got it all cut. I figured I'd spend the evening winding them up in front of the television. I was going to contact the manufacturer tomorrow on the status of the other 2 colours, I'm sure it shouldn't be more then a week behind. At the last SU! meeting I attended, we were shown this fun icicle technique. It's really simple, but requires some patience. Basically, squiggle some Crystal Effects on some wax paper, make it look like icicles. Next, sprinkle with glitter and then let it dry overnight for optimum results. Anyway, so I made my icicles yesterday, now all I needed was a card for them to go on. 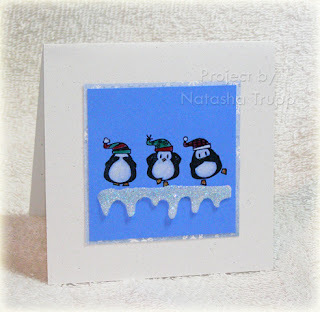 The "no evil" penguins seemed like the perfect subjects for the scene. 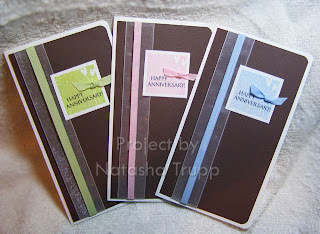 I stamped them in versafine black on ballet blue paper. I coloured them in with prismacolor pencil crayons. These showed up really nicely on the darker paper. Next I added my icicles. Peel it off the wax paper carefully, cut to size and attach it to the project. I found that ultra sticky tape worked best. Other tapes just weren't sticking! I hope you try your own icicles. I have all sorts of other ideas with this technique. If you do try it out, I would love to see it via a link in the comments. I'll be busy this weekend. I am in a wedding tomorrow, so don't expect much updating until maybe Sunday night. We'll see how energized I feel. The next card was done for the Ways to Use it challenge. The product to use: Basic Gray or Charcoal cardstock. I really liked the outcome of my first card, so I thought, why change things. At first I struggled with what I wanted to pair with the grey. I had already chosen a set- Stem Silhouettes. Finally, I remembered this awesome ribbon I found at Fabricland on the weekend. It matches Purely Pomegranate practically perfectly (sorry, couldn't resist the alliteration). So I stamped the stem once in the, then I stamped the faded image once to either side of the brightest one. I wanted to do the designer paper panel again, but don't have any printed paper to match. So what to do?? Looking back, I realize my Rose Red papers from the Palette of Prints would've worked just fine. However, I made my own designer paper instead. I pulled out an old favorite- Houndstooth, and stamped with white onto the grey. 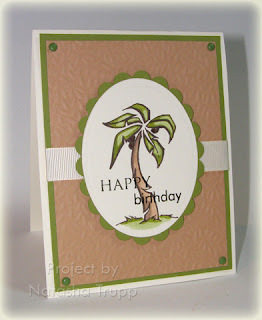 I wanted this card to have a little something more, so I also stamped the card base with Linen. I received these fun Cat's Pajamas stamps today. 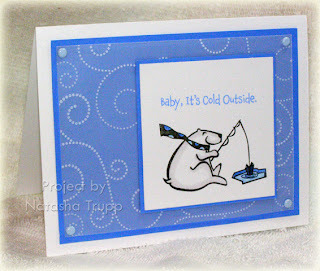 I stamped this cute fishing polar bear then coloured him in with various blue markers. I added a bit of shading to his body with a grey marker. The 10% grey prismacolor markers work perfectly for adding that little something extra, that pop, to something that's supposed to white. The piece of paper on here that looks like patterned paper is actually a piece of vellum stamped with various dotted flourishes. I attached it to the ballet blue piece with bashful blue brads. I find that when I have images that take more time to colour, I veer away from busier cards. I guess I just don't want anything to take away from the image that I spent all that time on, you know? 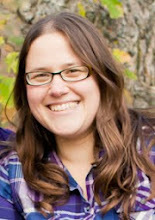 Some other exciting news for me this month- I am now also on the Starving Artistamps design team! They have quite a variety of fun images to work with. I thought I'd share 2 summer-themed cards I made yesterday. 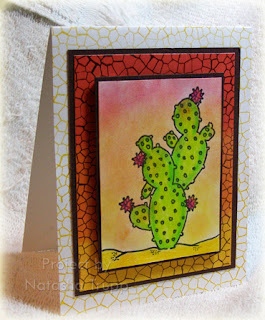 The first I used this neat cactus (here) and the cracked mosaic (here). I started with the cactus, stamped in black stazon. I coloured it in with prismacolors and OMS. I doodled in a ground so it wasn't floating, since I knew I wanted to add a bit of a sky. For that I simply took a dauber into a few different chalks and blended. The next part was lots of fun, since I'm sure everyone knows how obsessed I am with spectrums. I brayered ruby red, pumpkin pie, then summer sun. When I brayer a spectrum I start with the darkest, and for each lighter colour I go back over the darker colour so they blend better. So I brayered ruby on a third of the paper, then I brayered pumpkin over the next third, but also back over ruby, etc. 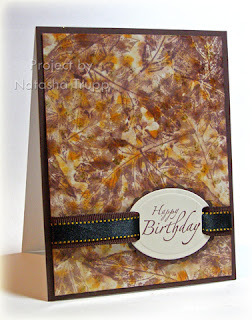 I stamped the cracked background over top with brown stazon. 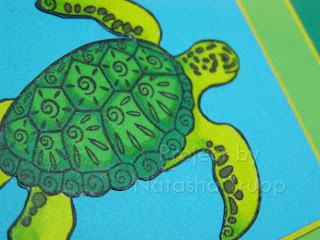 The next card features some of Kristin Soboloski's Artful Inkables . I used this lovely flower. 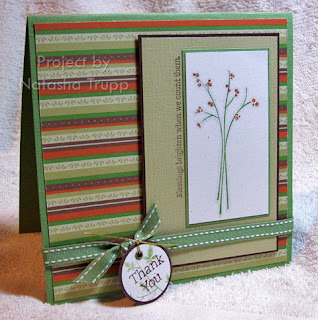 Once again I stamped with stazon, I masked the flower then stamped the leaves. I thought twinkling H2Os would work well for this image. I kept blending and added colour until I got the look I wanted. The sentiment is also by Kristin. This card features many interesting Dollarama finds. Both metallic papers (the maroon and the gold) are from there, as are the rhinestone brads. This card sure shimmers in real life!! The other day, we went out shopping. I saw these awesome dishes at the Urban Barn. Unfortunately I cannot find an image of them on the internet, but I think my version did it justice. Basically, they were a light blue (I used Soft Sky) and they had brown and white plants to the right. Very nice. I don't really need dishes though, so there they stayed. 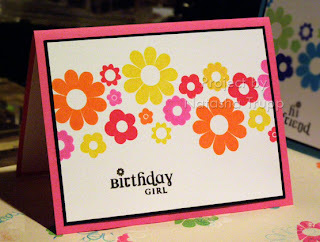 I used the Paper Trey Ink set, Beautiful Blooms and Stampin' Up! Craft inks- creamy caramel, chocolate chip, and whisper white. The card base is actually a square that I attached to the circle, then trimmed so you couldn't see it. Are you in or near Winnipeg? A few SCS-ers are putting together a meet and swap on October 20th. Check out the details here: http://www.splitcoaststampers.com/forums/showthread.php?t=282198 and contact the coordinator if you can make it! It'd be so much fun to meet more stampers! I got my second shelving unit yesterday, so I've been busy moving stuff around. It looks SO much better than it did before. I almost wish I had taken a before shot, just to compare it... I have no idea who makes these shelves, what they are called, or anything like that. The pharmacy where my mom works had bought some new shelves and display cases, so these were no longer of any use to them. They were mostly filled with the travel-sized items- mini shampoos, shave gels, toothpaste, that sort of thing. So I filled this one up with my full sheets of coloured SU! cardstock, my clear stamps, other embellishments, colouring items (markers, twinkling h20s, pencil crayons), the rest of my ribbon, small paper packs (6x6 basic grey, and DCWV mat packs), and some of my favorite retired stamps. There are two chairs in the photo, that is where the table is. To the right of the table I have 3 drawer units- stamps, paper, and other stuff. On the floor in front of the shelf I've got my scraps rolling filer. In other news, and some of you congratulated me already- THANKS! 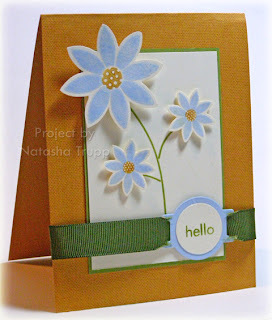 I was one of the guest star stampers on Paper Trey Ink! I was so busy looking at all the stamps that I forgot to even check the gallery at first. Well was I ever excited to see my name up there! So here's the card that won for Spooky Sweets. It was really tough to pick which set I wanted- they are all so amazing. I have a soft spot of ornaments, so I went with Take a Bough. It's got a good mix of images and cute sentiments. In other, other news, the Dirty Dozen released a few a changes to make being in the Fan Club more interactive and fun! Each month, upon gallery release, we'll be sharing our theme post. That contains the central theme and 4 other challenges- more is more, product/material focus, inspirational and sketch. I was really excited about the sketch because I provided it this month. I can't help but beam with pride when I see all the amazing samples from the other team members, and now from other Splitcoast community members! It's such an awesome feeling! So if you're a fan club member already, be sure to check out here. If you're not a Fan Club member, and are considering it then check out here. 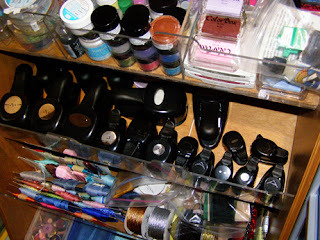 If you're a frequent visitor to my blog, you may have noticed that I have NEVER shared a glimpse into my stamping space. Why is that? My "studio" is in complete shambles about 97% of the time. But slowly, I am trying to change (it's a little hard when you keep acquiring new stuff though). Earlier this summer, I picked up the Ink Caddy. It was one of those purchases I didn't want to make, but was really necessary. There's so many other fun things to spend that money on right! I've got 4 sets of those rollable drawer stations. They work quite well, most of the time. I've also got a cutting station (which is currently in a state of disaster). I've also got a dry embossing, wet embossing, and die-cutting station (basically those 3 items jammed onto a tiny desk on the boundaries of my area). I try to keep that one tidy because each of those 3 activities require a fair bit of space. Anyway, today I was offered not one, but TWO tall shelves with bins. I only have one so far, I'm picking up the other one tomorrow. I am LOVING it so far! 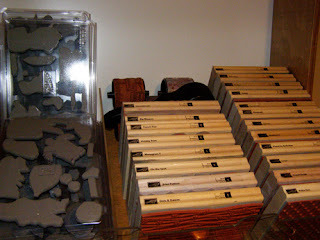 So brace yourselves everybody, here's a glimpse into the space that is my stamp studio. My previous background stamp storage was terrible, and at times dangerous, so I would stop using all but the 3 I left out. I never used my Pink Cat stamps because they were out of reach. No more! I also put the wheels up there. I don't see myself getting any more background stamps, but there's space if I need it. 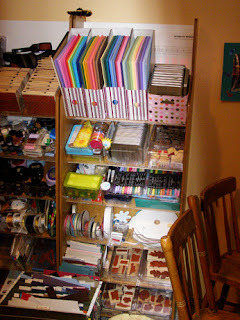 The next shelf contains various embellishments, etc, separated by acrylic dividers. I've got buttons, brads, and eyelets in one space. Next there's watercolor paints and various sparkly and shimmery items (pearl ex, glitter, etc). Then there's my retired and non-Su inks. The next shelf, and this I was really excited about, is for punches! Before, I managed to fit all those in a drawer. It wasn't pretty. And that drawer weighed a ton. If you needed the punch at the back of the drawer, you risked dropping the drawer or tipping the whole storage unit. No more!! Next I have my ribbon (the previous "organization" was a box on the floor and one drawer- it's not all of it, more will go in next unit. The bottom 2 spaces are still a bit undecided. For now I've got more embellishments, various parts of Simply Scrappin' kits, fiskars texture templates, loose stamps and chipboard. Those may change. 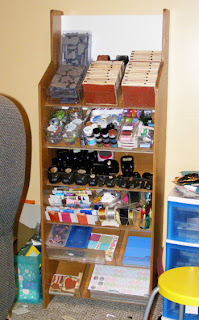 In the next unit, I will be putting some paper, my clear stamp collection, more ribbon, pencil crayons, and items like the pretties kits, hodgepodge hardware, alterables, and possibly paper. So there you have it. A tiny glimpse into my stamping studio. Trust me, you definitely don't want to see the rest right now. I just received the Stem Silhouettes set and was itching to use it. 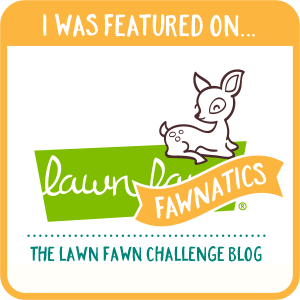 In my morning blog perusal, I happened upon Beate's sketch challenge . The design was perfect for the long images in this set. Even the greeting is perfectly paired to this sketch. I stamped the main image with wasabi and rust onto naturals white cardstock, then outlined with a 10% cool gray prismacolor marker. For the bottom horizontal strip, I used some wasabi double stitched grosgrain. In place of the flower, I put together a little circle tag. 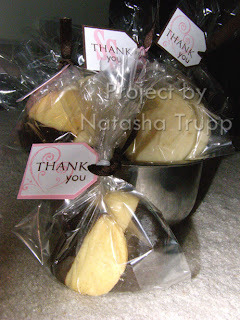 The thank you sentiment is all in one line, but with the markers and careful stamping it easily becomes a two-liner. This particular retro shape from the gel-a-tins set Mini Retro Flakes is one of my favorite designs in the whole set! I only used that snowflake for this card. If you have the regular Retro Flakes as well, there's even more of this shape in some more sizes. Anyway...I stamped the one size on little squares, coated them with Pearly Sparkle embossing powder and then some gelly gems too. The bottom turquoise panel was stamped with 3 different sizes of the same shape. 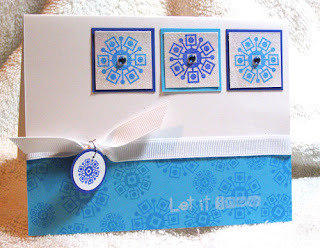 I stamped the let it snow greeting in white craft over top. It shows up better in person. I finished the card off with ribbon and a little snowflake tag. The elastic silver cord is SO nice for tying charms, it doesn't fray when you are trying to weave it into a small opening! Here's another card featuring a Doodle Factory creature. 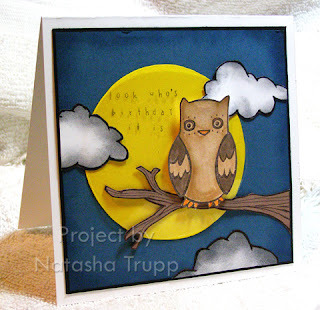 I wanted to colour one of the images, I picked the owl, and from there this card just grew. The owl needed a place to sit, so I drew and cut out the branch. Then the branch needed to be part of a scene, so I traced a roll of tape for the moon. Then the sky needed a bit more something, so I drew and cut out some clouds. Finally, I needed a greeting, so bring on the puns! My sister provided me with this one. The greeting, done in snap stamps, is on a piece of acetate the same size and shape as the moon, just in case I made any mistakes. It also gives the moon a bit of a glow. I placed the owl up on foam tape to give a bit more dimension to the scene. I sponged all the other scene elements- the moon, clouds, and sky, with various colours to also add more depth. I haven't really done a card like this before, so I had lots of fun with it! Woot, I received my Doodle Factory stamps today. Check them out here and here. If you order the sheet, it includes both sizes! I hadn't realized that so I was super excited when I open up my package. On these little notecards, I used the larger images. The cards are 3x3. I paired up the characters with sentiments from the So Many Sayings set. I coloured these with markers, reinkers, and an aquabrush. I doodled in some lines and gave the Frozey character a rainbow afro. It just seemed appropriate! Thanks for the congrats everybody! I appreciate it. I am not allowed to scan in the page (I actually haven't received my comp copy yet anyway). I am allowed to share the project online again in a few months. 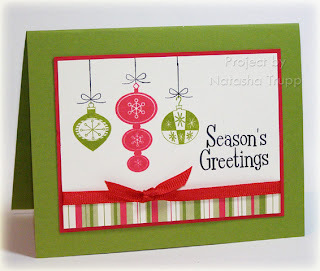 It's a simple card, using the strawberry from a Paper Trey Ink set- Green Thumb. I really had no idea what kind of card I was going to create tonight. My sister and I visited my grandma for lunch today. She was wearing a shirt that had inspired this colour combo- white, teal, turquoise, river rock, and celery. I had those colours in mind, but no idea what I wanted to do. I had pulled out the Bloom set by gel-a-tins first, but it wasn't coming together. Next, I tried Funky Flower Garden. It slowly began to come together. I hadn't wanted to cut out any flowers, since I was cutting for about 2 hours yesterday doing the favours. So what happens? I ended up cutting out the flowers! At least it was only 3 of them. I liked the idea of putting them together in a flowerpot formation. I used some dotted river rock paper and some ribbon as the "pot". 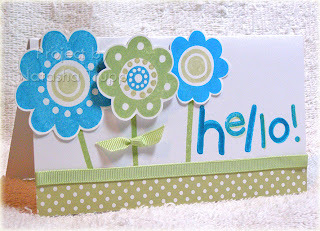 Finally, I thought this card just screamed HELLO! 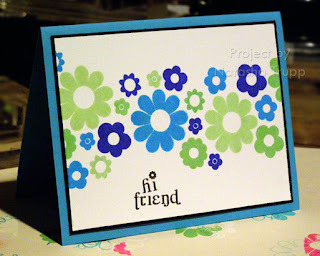 So I put together some letters from the Oh Gosh By Golly alphabet in a fun way and stamped that greeting on there. The card measures 6-3/8x3-1/2. I was at a LSS today and I happened upon the September issue of Cards. I quickly picked it up and scanned through the issue until I came upon page 138. There it was! My first publication! I was very busy today, making 150 wedding favours for my friend's upcoming wedding. We decided on doing a bit of variety. Her colours are pink and brown. We spent the day baking sugar cookies, dipping them in chocolate, wrapping them up in cello bags and of course, sealing the bags with some ribbon and the stamped tags. I brought a variety of clear stamps. I figured with novice stampers and mass production, being able to see placement was crucial. It definitely sped up the process!! I don't have a super great photo, it was a very dark and gloomy day. Here's a sampling of them though. In other news...Canadian Ribbon Share! 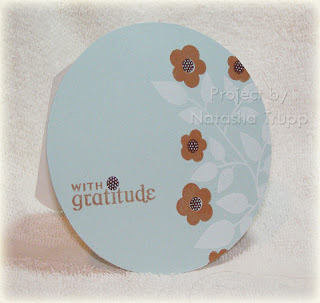 I received my samples and have colour-matched the colours to Stampin' Up! 's paper. The Vanilla, Burgundy, Red, Rose, and Brocade are all excellent matches. The Celery, Olive and Chocolate are good matches- they match the paper but aren't 100% perfect matches. I just want to be honest with everyone before going through with everything! In a workshop situation these colours would definitely be usable! I was also going to still go ahead with getting the 9th "bonus" colour. I was thinking about it. Originally I was going to do a colour that closely matches the Basic Gray colour. Now, I'm giving you the option, 5/8" white OR 5/8" grey. The total cost (including shipping) comes to an even $33.00 CDN. That gives you 90 yards of 5/8 ribbon total. (8x10 yards matching the SU! catalog available ones, and 1x10 or either white or gray). I prefer paypal payment. So, let me know if you are still interested in the share by email (on the right! ), what extra colour you are interested in (the white or the gray), and how you intend to pay if you are joining the share. 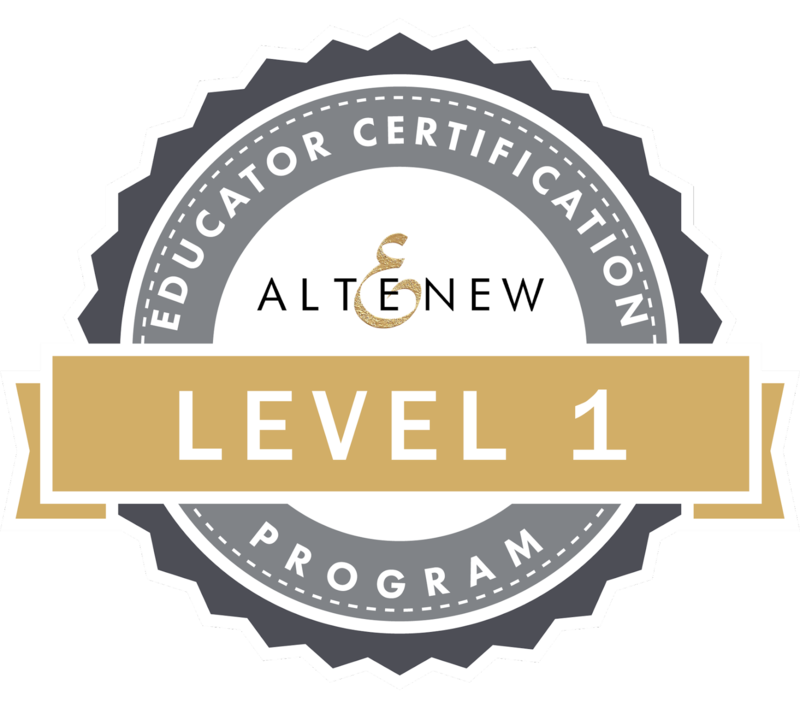 If you expressed interest in this a week or so ago and still want in, check you're email. You should have received a message from me on Saturday! So, early Wednesday morning by Grandma phones me- "I need 5 Anniversary cards by the 19th". What! You couldn't have mentioned this earlier!!! At the point, I knew what I would be doing on the weekend. I also needed to make 1 shower card. I made that first. The bride's colours are pink and chocolate, inspiring enough. I wanted only something small, so I found a chocolate pocket note and used that. 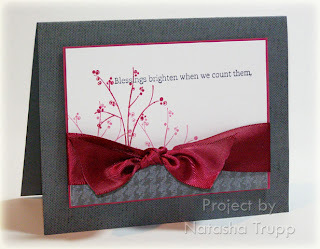 I stamped the bow stamp from Good Things Grow in pink, then embossed it with gelly powder- Pearly Sparkle. If you thought Iridescent Ice was good, this stuff is EVEN better! (For the full effect be sure to enlarge the photo, you can really see it on the green one!) Anyway, that was just a small project, no sense in sharing it, BUT... it did inspire me to make the anniversary cards. I started by double-checking the measurements of the images from Good Things Grow. They are approximately 1-3/8 square. So I opened up Elements and started a new document 1.375x1.375 at a resolution of 300 (this is important if you are doing sentiment printing, higher resolutions print SO MUCH nicer!). I placed that small document 10 times on another document and printed it. I left room to stamp the square image over the greeting. In case you are curious, I used the font Felix Titling. I have no clue whether I downloaded it or if it came with my computer, but it is similar to the Paper Trey Ink- Paper tray font. Anyway, I stamped the main image with colorbox inks. I used Baby Blue, Pistachio, and Rosebud, then covered them with the Pearly Sparkle gelly powder. Next, I attached white organdy and blue, pink, or celery grosgrain to the chocolate piece. 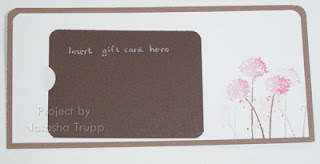 I rounded 2 of the corners of both the card base and the chocolate piece. Finally, I placed a glue dot at the union of the 2 stems and placed a tiny little knot there. Assignment completed! These cards measure 3.5x6-3/8. I have a lot of envelopes that size, so it works! My sister and I were feeling creative today, so she picked a random sketch challenge (#33) and we went from there. This is my card. 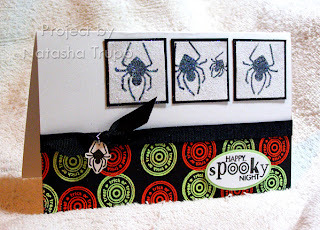 I stamped the spiders, punched them out then coated them with the glue pad and glitter. I matted them on black squares. Next, I stamped the Trick or Treat medallion with versamark and embossed them with orange you happy, and get in lime gelly powders (found here). I tied some ribbon on, but it wasn't feeling done, so I added a little spider charm. It still wasn't "there" so I stamped the word spooky. 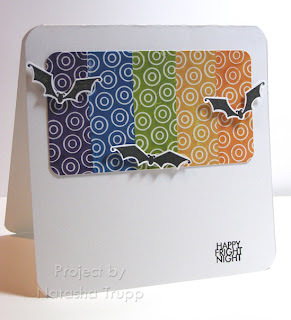 Then I added in the Happy and the Night from the Happy Fright Night sentiment. I punched that out with the large oval punch then mounted it on gable green and carefully trimmed to give it a nice mat. I must admit it was kind of frustrating making this- basically I do not recommend attempting to pour glitters or embossing powders while on the phone!!! 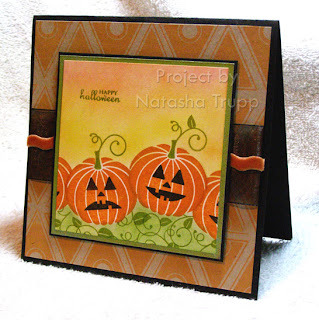 Here's a card I made using the new Paper Trey set, Spooky Sweets. I really wanted to make a pumpkin patch scene. I masked the pumpkins, then added in some shading with a cool grey marker. Next, I added the faces. I wanted some variety so I turned the smile on one into a frown. It worked perfectly! 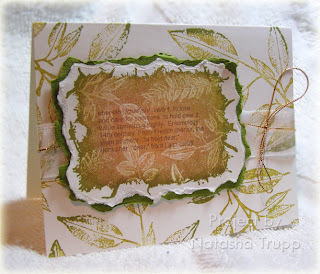 For the rest of the patch, I stamped the swirly image and the leaves from the Green Thumb set. Next, I was feeling a tad lazy. I wanted to colour in the rest of the scene, but really didn't want to mask more. So I chalked it! It coloured the white paper just enough and if I accidently got some on the pumpkins, it could be wiped off. Plus, I could then make a nice harvest sky. 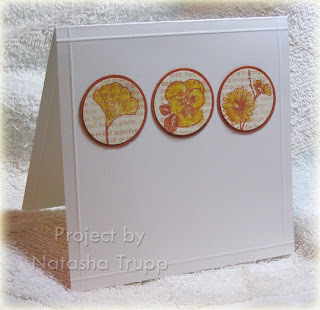 The background is the 2 large eye images stamped in orange on kraft paper. This is a card I made for my grandmother's friend. I needed to keep it flat, since she'll be mailing it, so no big embellishments, knots, or bows here. I coloured the flowers with lilac and amethyst, and the smaller flowers lavender. The leaves are done with wasabi and celery. I outlined all the flowers with the 10% cool gray prismacolor marker. 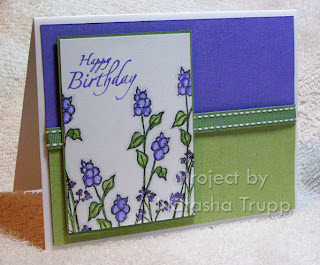 The background stamps are linen on the lilac, and the sanded piece from this floral set. On another note, have you see these ADORABLE images by Doodle Factory!!! Check out this mini card I made for my dad. It's 3x3, with the little guy hanging over the edge (it seemed appropriate). The card features "Zot", which I got from a friend. 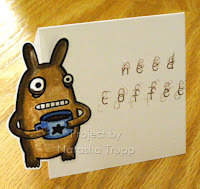 I stamped the greeting "need coffee" 4 times, using the generation stamping technique. My dad said the little creature wasn't jittery enough, lol. I guess I could've doodled in some jitter marks. I coloured it in with SU! markers. I was playing around with some quick layouts. This one worked out even better than expected! I like the first one so much, that I made a second, just changing the colour scheme. Then I decided that my mass Christmas card will follow the same format, only with snowflakes (I'm going to use the gel-a-tins Retro Flakes for one style, and the Fancy Flakes for another) and with a more holiday colour scheme (I was thinking glorious green, green galore, real red, and gable green for one, and night of navy, ballet blue, bashful blue, and brocade blue for the other). This one was actually inspired by the colours of Maya Road's velvet blossoms- the fire set. Originally I was going to use those on here, but I loved how it looked without, so I left it. I used all Paper Trey flowers, some from beautiful blooms, green thumb, and paper tray. The other one was was just kind of the opposite side of the Bold Brights spectrum. I guess all I need to do now, is make a purple themed one! I had a little boo boo on this one. My clear block wasn't too clean, so I stamped friend a tad crooked. To make it look intentional, I simply stamped the hi the opposite tilt.